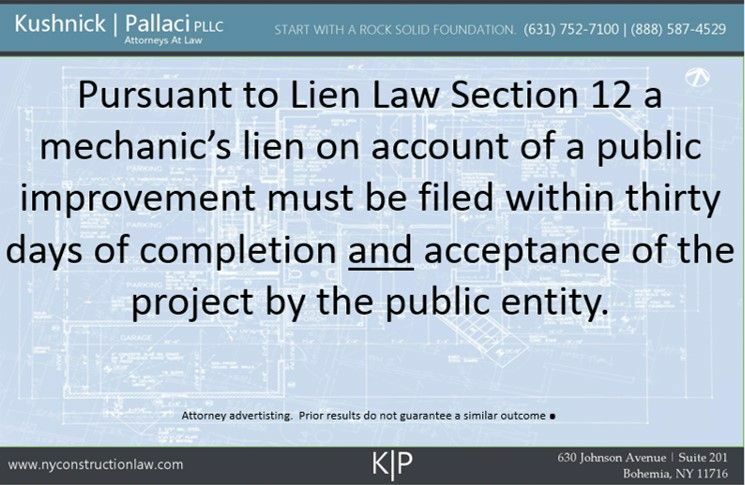 Lien Law Section 12 seems pretty clear but its always nice to have the Appellate Division confirm that clarity. In Munoz Trucking Corp. v. Darcon Const. Inc. Munoz apparently filed a public improvement lien that mistakenly named Darcon as the general contractor. The interesting detail here was that that Munoz commenced a foreclosure action on its 2011 incorrect lien and, apparently, did not learn of the deficiency until 2015. It then corrected the lien in 2015 by filing a new lien listing the correct general contractor. Munoz then sought to add the correct general contractor to the foreclosure action and the general contractor sough to dismiss the 2015 Lien. The trial court denied the motion to amend and dismissed the 2015 lien. The Second Department reversed. The Court said that determining the dates of completion and acceptance was, generally, a question of fact. 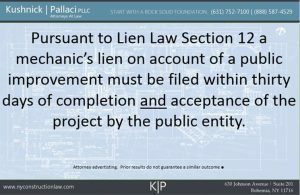 Since the general contractor did not definitively establish when the project was completed and accepted, there was no basis to dismiss the lien or deny the motion to amend the foreclosure action and allow foreclosure of the 2015 lien to proceed. One interesting detail missing from the reported decision is any mention of why it took Munoz almost 4 years to figure out the lien was incorrect. Did the School Construction Authority (the public entity running the project) not tell them for four years? Was there no discovery on this issue in the 4 years of the foreclosure action? Regardless, it seems that Munoz may have lucked out here but its a good example of how important it is to make sure your lien is correct and you know the correct chain of contract. Had Munoz been out of time, the lien would likely have been invalidated for this oversight that somehow stayed hidden for 4 years. For more information about our mechanic’s lien practice click here. This entry was posted in Construction Litigation, Lien Foreclosure, Mechanic's Liens, Public Construction Contracts, Public Improvement Lien and tagged Liens, Public Improvement Liens by VTP. Bookmark the permalink.